The 210 Bay Reef is our first venture into the performance bay boat market adding a pro level to our extensive and growing line up. The 210 BR represents a bold new approach in hull design. 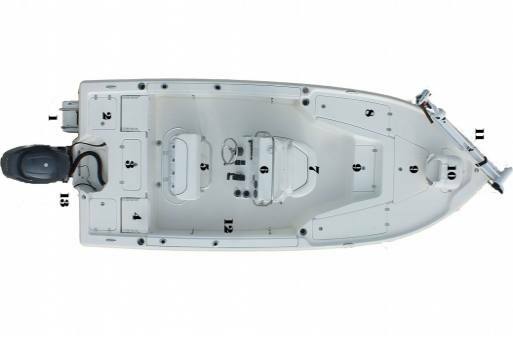 We've kept the time proven great ride of the 19 degree dead rise hull, but we've added a lifting pad to the bottom and an integrated jack plate to the transom. Now you can have it all with improved performance, fuel economy, and a great ride, and as a bonus it even sports a bit less draft. The improved hull isn't all you get. 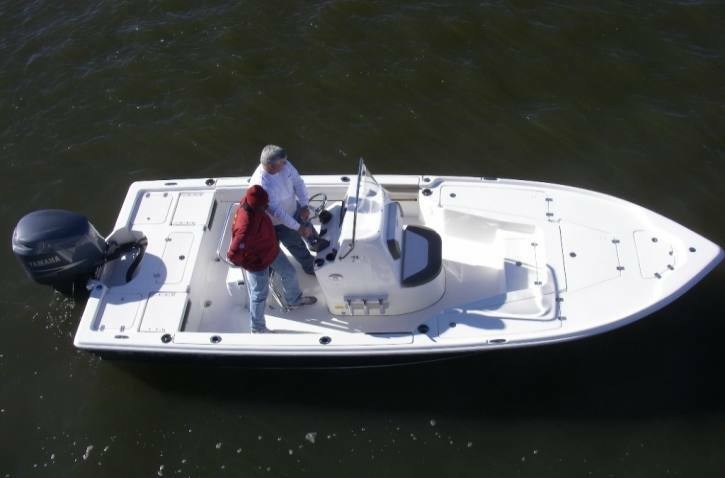 The interior has been tweaked and squeezed to get everything a serious fisherman could ask for such as space for 10 7+' rods in the lockable rod boxes, dual live wells, spacious front and rear deck, under gunwale molded in rod racks, and the first bay boat in its class with a potty room under the console. Yes, this is a family friendly bay boat as well with features such as fold away jump seats in the rear deck, and generous cup holders throughout. Check out the pictures and then check out the real deal at a dealer near you. Length: 21 ft. 1 in. 2 Rod Boxes lockable with 5 rod capacity each. Live/Release wells front and rear decks. Molded in seat with cushions on front of the console. Folding jump seats in the transom store flush and out of the way. Changing room under console can accommodate a potty. Recessed horizontal gunwale rod racks. 4 SS trolling rod holders with integrated drains. 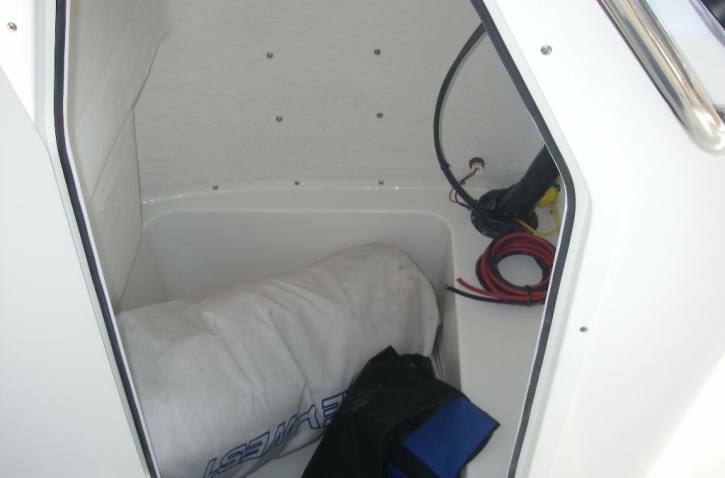 Large storage compartment in bow. 12 volt power outlet on dash. Troll motor harness and plug. 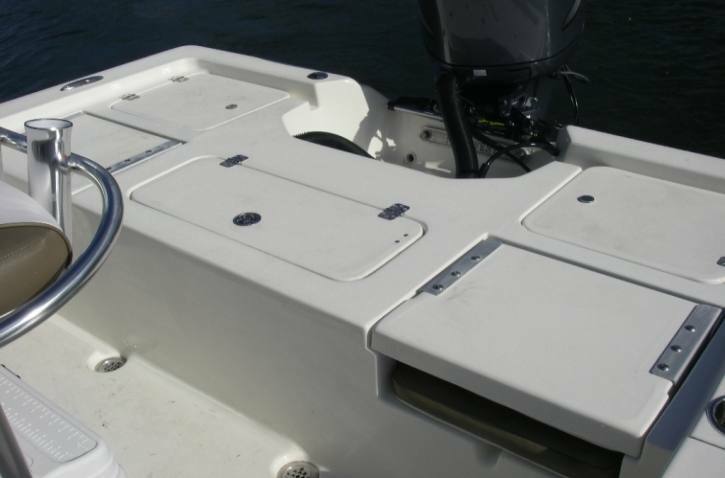 Bow and rear casting decks. Pull up fender holders, set of 4. Dual battery switch and wiring. Sea Star hydraulic tilt steering. Quick release bracket for Minn Kota Riptide troll motor. Troll package; Minn Kota Riptide 24V hand control 80 lb thrust with wiring and dual charger. Garmin 540s color depth finder/GPS combo. Troll Package; Minn Kota 24V Riptide 70lb thrust hand control with wiring and dual charger. Stainless steel bimini top and boot. T-top deluxe with radio box, spreader lights, and rocket launchers. Casting seat with base and pole. Flip flop cooler seat with 94Qt. cooler. Stereo and MP3 port with 4 speakers. Garmin 440s depthinder/GPS combo unit. Rear deck cushion with back rest. Aluminum bimini top and boot. Hull colors; White with SS rub rail, Horizon Blue, Ice Blue, Midnight Blue, Fighting Lady Yellow, Sage Green. Auto retract switch and level indicator for trim tabs. Deluxe leaning post with back rest and rod holders. Additional pull up cleat or cleats. Swim platform, molded fiberglass with telescoping SS ladder. Yamaha Command Link 2 gauge package. Yamaha multi function tachometer and speedometer.